If you didn't know the name Rick Snyder before this week, you will definitely know it after this week. In signing legislation Tuesday to make Michigan a right-to-work state -- read this explainer to understand what the law will do -- Snyder put himself in legion with the likes of Wisconsin Gov. Scott Walker and Ohio Gov. John Kasich, both of whom rose to national prominence after passing legislation that earned them the ire of organized labor. Like Kasich and Walker, Snyder is being feted by conservatives, who have long viewed the need to pay dues to join a union as overly burdensome, and demonized by liberals who view the move as an ideologically-motivated play to limit the political power of unions. "Governor Snyder showed his true colors today: He’s a puppet of extreme donors, and he is willing to ignore and lie to his constituents," said AFL-CIO president Richard Trumka Tuesday. "His action will undoubtedly please the Koch Brothers and corporate CEOs, but it will diminish the voice of every working man and woman in Michigan." And, like Walker and Kasich, what Snyder has done by signing the right-to-work legislation is turned himself -- and his re-election race in 2014 -- into a top national priority for both parties. To be clear: Snyder was going to be a major Democratic target in 2014 whether he signed this law or not. President Obama won the Wolverine State by nine points in November and Sen. Debbie Stabenow (D) was re-elected by 21 points. But now, Snyder will become the poster boy of the right and the left, and his re-election campaign will amount to a proxy war between organized labor and the conservative interests who would like to limit union power. In short, Snyder will be the the Scott Walker of the 2014 election. And, like Walker, Snyder starts out in decent position to beat back what will certainly be a very serious (and well financed) challenge from Democrats. That same poll also showed some troubling signs for Snyder, however. Just six percent of those tested said that passing a law to make Michigan a right-to-work state should be a top priority for the outgoing legislature. (Asked whether they supported making Michigan a right-to-work state 47 percent of respondents said yes, 46 percent said no.) Placed against a generic Democratic candidate, Snyder took 41 percent of the vote to 36 percent for the Democrat -- a sign that a number of people remain undecided about him. And, Snyder will have to find a good answer for why he was on the record in opposition to right-to-work legislation as recently as 2011, describing it as too "divisive". While Michiganders may be split evenly on whether they like the right-to-work law, all voters dislike flip-flopping politicians -- and that's exactly what Democrats will try to paint Snyder as. 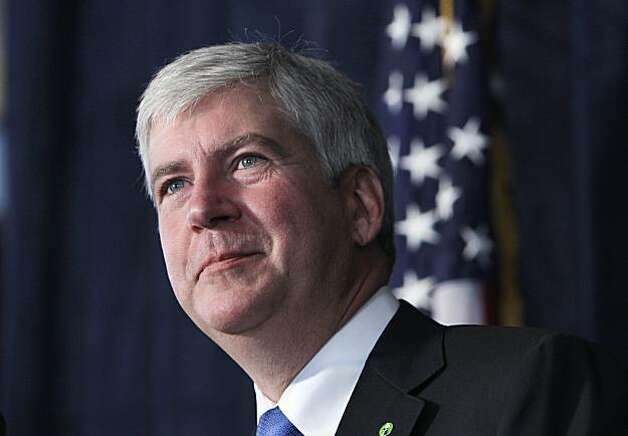 Snyder, on the other hand, will seek to put the right-to-work law into a broader context of what he has done over the past four years -- likely highlighting that he, unlike other Republican governors, vetoed a voter identification law this past fall. He'll also likely try to re-invigorate the idea of himself as "one, tough nerd" -- and outsider businessman not beholden to monied political interests -- that worked so well for him in 2010. But, given the political heat that the right-to-work debate is and will continue to generate and the fact that the union movement began in Michigan, it's clear that Snyder's race will have the fight over the proper role of organized labor at its center. As Walker proved, that's a race that a Republican can win. (Worth noting: Walker won a recall election with far different turnout than a regularly scheduled race in 2014 is likely to have.) But, it's a race that, like Walker's, will feature tens of millions of dollars in outside spending as both national parties and their aligned interest groups will view it as a chance to send a message. By putting his signature on the right-to-work legislation last night, that's what Snyder wrought. Let's see if he -- like Walker -- is ready for what comes next.